The Galvin Hop pub is teaming up with beer brand Pilsner Urquell to launch a winter garden. Opening on 14 November and located next to the pub in London's Spitalfields market, the Bavarian style winter garden will feature rustic wooden-barrel tables set against a backdrop of festive fairy lights and Christmas decorations. It will be available for both public and private hire. The garden can accommodate up to 30 people seated, an additional 40 standing and up to 80 people on its private terrace. It aims to be a go-to place for after work drinks, as well as a venue for Christmas party bookings. As part of the partnership with the Czech beer brand, the winter garden will have its own bar comprising of a 250-litre copper tank serving fresh unpasteurised Pilsner Urquell, delivered weekly direct from Pilsen in the Czech Republic. Each tank will serve up to 440 pints and will feature three Czech pours. These are known as Hladinka, which is a smooth pour and the classic Czech way to pour Pilsner Urquell with half of the pint comprising of foam. Na dvakrát is crisp, featuring the least amount of foam and a smaller head, making the beer more refreshing, while Mliko is the closest thing to a Pilsner ice cream, made up of mostly foam. The Bavarian-themed menu will feature snacks such as saddleback pork rillettes and remoulade, Cumbrian beef rump burger and tarte flambée. The winter garden will be open from 14 November 2016 - 31 January 2017. 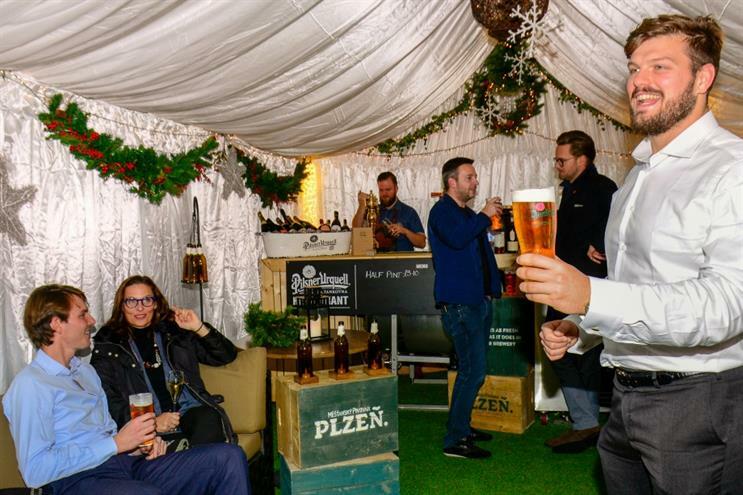 On 12 November, Pilsner Urqeull will host a masterclass in beer pouring at London's Duck & Rice, On 7 November, John Lewis opened its rooftop winter garden at its Oxford Street store.